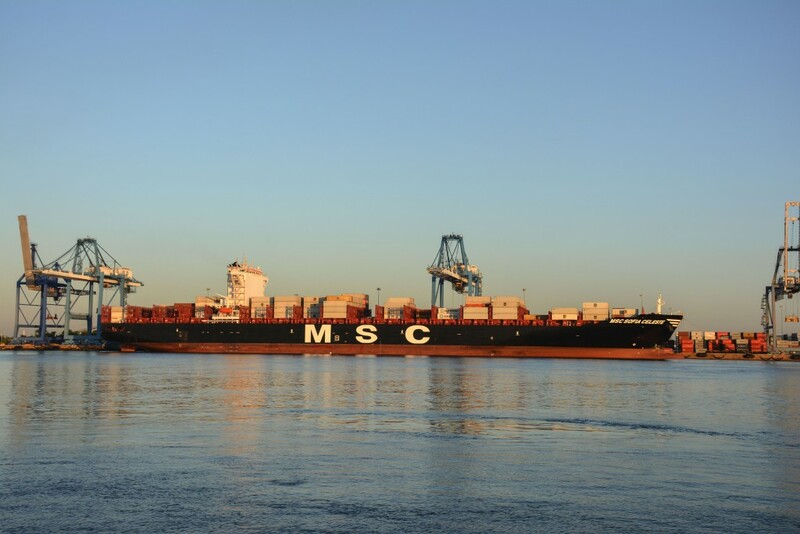 The MSC Sofia Celeste, an 8,800 TEU ship, is first in a new class of vessels to begin service between the West Coast of South America, East Coast of North America and Northwest Europe. ABOVE: MSC Sofia Celeste (left) LOA: 984 ft. and SeaLand Stadt Gera (front/right) LOA: 545 ft.
refrigerated container plugs for transporting perishable cargo. 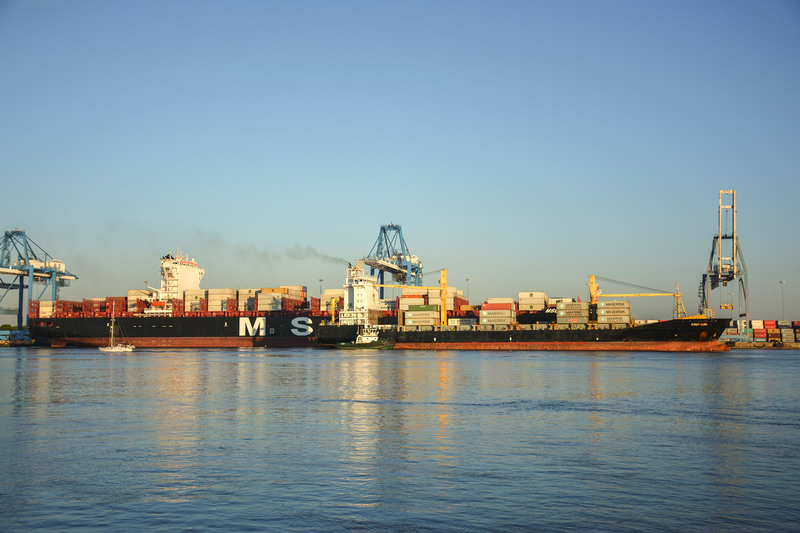 ABOVE: The ship is the first to trade on MSC’s newly redesigned South America West Coast-USA-Northwest Continent service line, which makes stops in Chile, Peru, Ecuador and the Bahamas, before calling Philadelphia and then heading to Rotterdam. ABOVE: The Sofia Celeste is the first ship to dock at Port of Philadelphia’s Packer Avenue Marine Terminal from the newly-expanded Panama Canal locks. 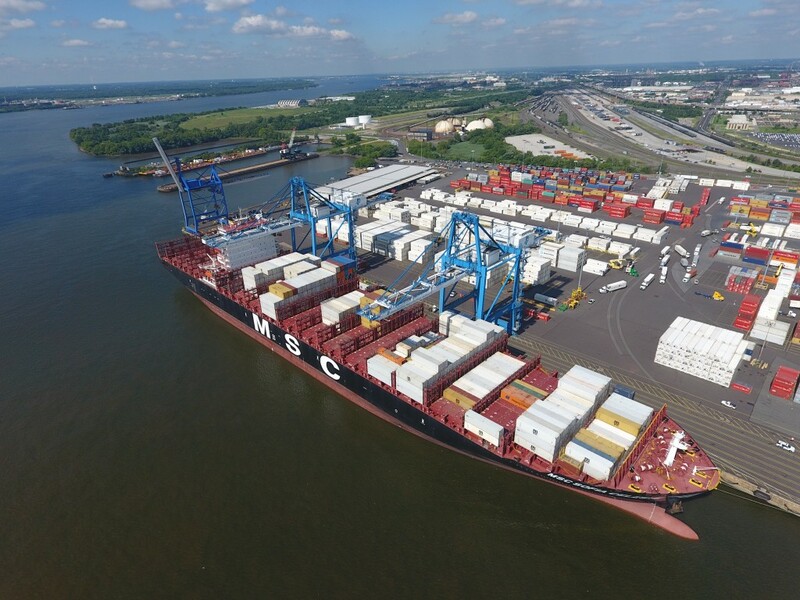 On Wednesday, August 3, the first of a new class of “Neo-Panamax” shipping vessels called the Port of Philadelphia to begin a new phase of transport along the Delaware River. The MSC Sofia Celeste, an 8,800 TEU (Twenty-foot Equivalent Unit) vessel operated by the Mediterranean Shipping Company, docked at the Packer Avenue Marine Terminal in South Philadelphia for the first time, making it the largest ship to ever call the Port of Philadelphia. 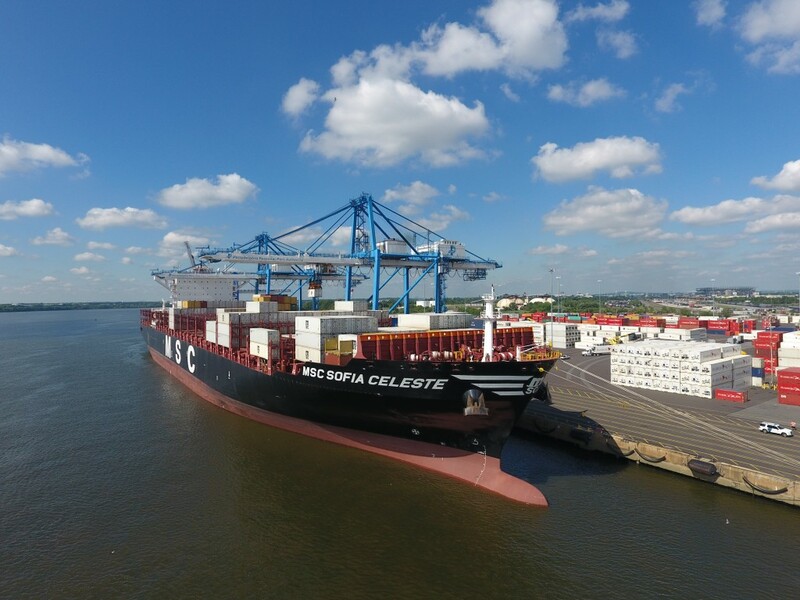 The MSC Sofia Celeste was completed in 2014 and has an on-board capacity of 8,819 TEU’s, of which 1,462 can be used with refrigerated container plugs for transporting perishable cargo. 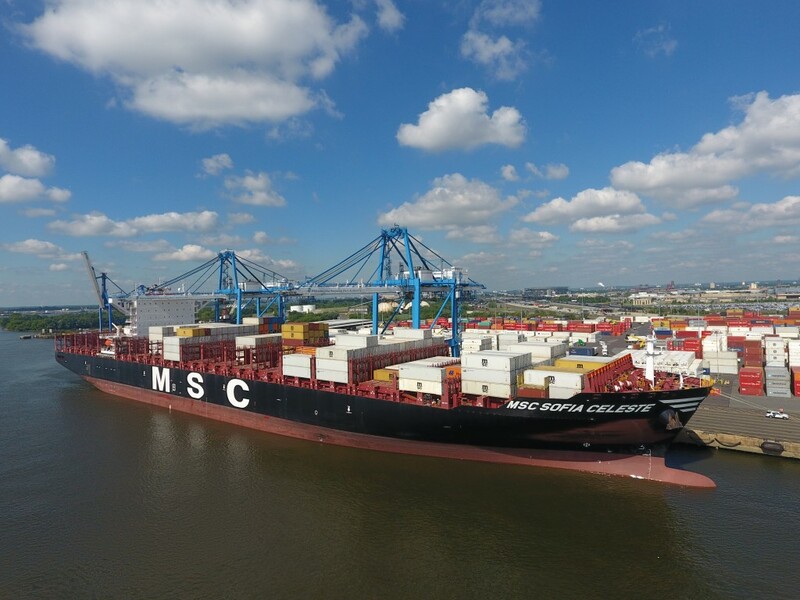 The ship is the first to trade on MSC’s newly redesigned South America West Coast-USA-Northwest Continent service line, which makes stops in Chile, Peru, Ecuador and the Bahamas, before calling Philadelphia and then heading to Rotterdam. Holt Logistics projects this new weekly service will not only produce more imports from South America through Philadelphia, but also increase volumes from the Midwest destined for export to Northwest Europe. 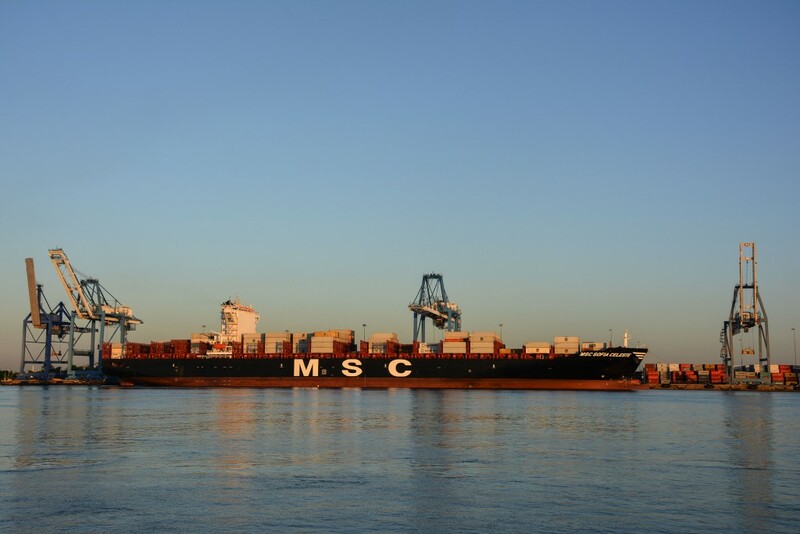 For more photos of the MSC Sofia Celeste, visit the Port of Philadelphia on Facebook. Holt Logistics/Greenwich Terminals, LLC. operators of PRPA’s Packer Avenue Marine Terminal.